Since purchasing the property in 1999 David and Tanya Bryant have meticulously set about developing their small Yarra Valley vineyard, and the resulting wines made from it, into a powerhouse of European classical style. The early wines were made by Phillip Jones of Bass Phillip fame, however the more recent wines were made by David, having undertaking his apprenticeship with the big guy. Current production is under 1,000 cases per annum which surely gives the Bryants leave to call themselves “micro-boutique”. If I’m right, the vineyard produces four levels of quality – Village, Estate, Premium and Reserve. The Village wines come from newer plantings since 2000, while the higher end use the fruit from the original 1970 plantings. Tonight’s wine is under the Estate label and it looks a little like this..
A lively red brick colour, slight browning around the rim. The first whiff and you get a sense for the European style these guys are chasing. It looks classic claret, and the word is ‘black’. Black tar, black olive and blackcurrant. To redress this dark fixation I’ll note a little white pepper on the nose and some juicy redcurrant. Pencilly oak hangs in the background and the wine opens further to reveal some herb and florals – fresh-cut sage, rosebush, rosemary jelly. It’s quite seductive really. You know it’s not a big wine, but all on the nose appears complex and complete. So far, so good. The palate is soft and plush, plummy. There’s savoury olive again and some rare lamb in its juices. The sweet/savoury balance is finely tuned. Again, old-fashioned claret springs to mind. The wine has the appearance of being quite simple, with medium weight and length, but its seductive powers lie in the flavours and balance. Blackcurrant dominates, cedary oak, fresh herb, silky tannin. A wine of texture and class. It’s good. I could not find fault with this wine – it’s no orgiastic, hedonistic mind-blower, but there’s a restrained elegance and sophistication that really appeals. We dusted it off with some home-made pizzas and it went down a treat. I guzzled it. Value: $37 at the time of purchase. It’s up there, and I know my notes are all positive, but I think it’s probably a bit on the high side. 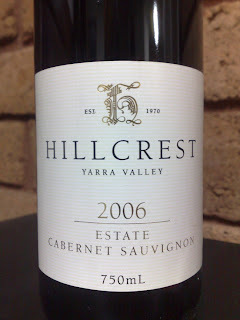 Producer: Hillcrest Vineyard – www.hillcrestvineyard.com.au – Established in 1970, purchased by the Bryants in 1999. Now farmed as organic and yields are between one and three tonnes per acre. Site: High elevation, grey gravel over yellow-grey loam. The vineyard is reportedly unirrigated. Vintage: Good spring rains followed by a warm summer and mild Autumn. A very good year with optimum hang time and ripeness.